Technical problems are as varied as the existing approaches for solving simulation. Calculation methods that are constructive for an application or a problem are not necessarily suitable for all other requests to the same extent. SES-Tec is the ideal partner for the most complex problems and enables an adaption of the simulation models to individual customer needs. Our services range from the creation of specific “user defined Functions” (UDF’s) to thereby image special effects to the automation of the most complex simulation processes. General, the software licenses are extremely expensive, so that resulting project costs limit the application of the computer modelling in small- and middle-sized companies. However, experience shows that in most cases such expensive simulation software is not necessary to solve a technical problem, but often can be analyzed by minimal physical simplifications and the concentration on core physics of the technical problem in a simplified form with relatively efficient (fast) and accurate zero-dimensional (0D) numerical codes. This numerical implementation enables a focus on the specific problem and the resulting simulation model is in most cases more efficient and usually much cheaper than general commercial simulation software. 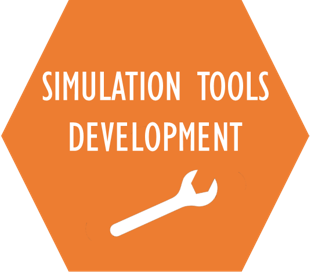 Another activity in this area is modification, optimization, improvement of usability, and documentation of the pre-existing in-companies developed simulation tools. A typical example could be a code rewriting, in order to improve calculation speed, programming of a Graphical User Interface (GUI), programming of additional models and macros etc. For more complicated technical problems, such as complex 3D-simulations, SES-Tec provides customers introductions, adaptations and support for Open-Source software (free software), which are usually arisen from countless number of dissertations and other academic projects world wide. This activity is very close connected to the area “Consulting and Service”. Nevertheless, in the area focus leads on the adaptation and further development of Open-Source software according to demands of customers, offering an opportunity for a low-cost software solution directly applicable in product development process. Besides the expansion of Open-Source software, this area also includes the expansion of commercial software with customer-specific models, so called “user-defined-functions” (UDFs). By integrating these UDF’s, the functionality of conventional simulation programs can be expended and adapted to customer’s demands. The SES-Tec has already shown their expertise in this field in various industrial projects, see references. The group “High Performance Codes” is an essential part of the area and can be seen as a strategic pillar of SES-Tec. The development of complex numerical tools is planed in domains where commercial codes fail. This can be for instance due to missing of numerical solutions for a given technical problem or due to poor computation performance caused by none adequate software and hardware. A solution for the above mentioned problem is a new technology based on the newly available “Compute United Device Architecture” (CUDA) technology. The technology allows high-performance calculations on already available hardware, “Graphics Processing Units” (GPUs). The massively parallel computing platform and programming model of NVIDIA, leads to an increases in computing performance, in contrast to conventional “Central Processing Units” (CPUs), up to 100 times faster. Due to SES-Tec experience in the usage of the technology, SES-Tec can provide their customers multi-physics and coupled simulations on a lower price level of the hardware and in much shorter calculation times compared to all other competitors.